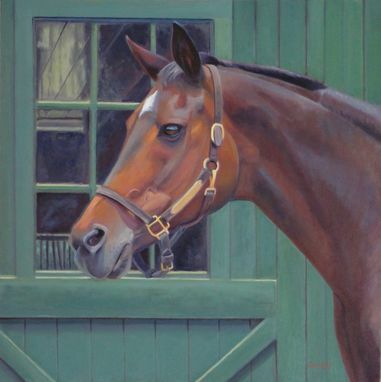 Mystic, a 23 year old thoroughbred and retired polo pony, was the subject of this commissioned equine painting. To increase the impact of the piece, the client and I chose a 2′ x 2′ square canvas because we wanted her head to be nearly life size. The project took a little over one month to complete and the finishing touch included adding her name to the bridle plate. Result: The client loved it. When I delivered the painting, I think she said "Wow…Beautiful." Which is music to my ears!